Book your next visit to Chandler, Arizona, at Fairfield Inn & Suites Phoenix Chandler/Fashion Center. 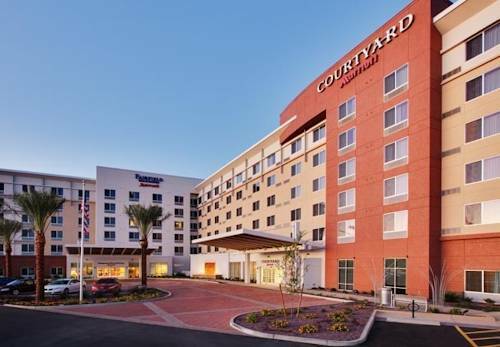 Situated just one mile from the Chandler Center for the Arts, Arizona State University and the Lone Butte Casino, our hotel is centrally located for business or leisure stays. With Interstate 10 right next to our hotel, accessing Phoenix International, Chandler Municipal and Phoenix-Mesa Gateway airports is fast and easy. Step into our newly remodeled lobby and enjoy a warm welcome. Settle in and find everything necessary for a comfortable overnight or extended stay in Chandler - from a business center to a 24-hour fitness center with a heated outdoor pool. All rooms at our hotel include free Wi-Fi and flat-screen TVs with HBO. Wake up in a two-room suite complete with a separate living area, mini-fridge and microwave before joining us for a complimentary hot American breakfast with Starbucks coffee. You may even treat yourself to a room with mountain views that bring the beauty of Chandler inside. 24 Hour Starbucks Coffee: We proudly brew starbucks coffee and beverages 24 hours per day, 7 days per week. Fairfield Inn & Suites Dining Room: Our hotel in Chandler, AZ serves a free hot breakfast buffet each morning complete with hot coffee, scrambled eggs, Belgian waffles, Dannon yogurts, assorted cereals & much more!